Innovation is part of the fabric of the puzzle/game industry. Constructors and game designers are constantly pushing the envelope, finding new ways to reinvent the puzzles and games we love in order to create new solving and playing experiences. Every new wrinkle is a step forward, and Looney Labs has been at the forefront of that movement for years now. And it’s only fitting that Fluxx, a card game all about dynamic gameplay and ever-shifting rules, continues to grow, evolve, and adapt, adding new gameplay mechanics to an already loaded bag of tricks. Their newest release also fits that ambitious aesthetic. After all, the Star Trek series has always been about boldly going where no one has gone before. Today, we’re doing the same as we review Star Trek Fluxx, Star Trek: The Next Generation Fluxx, and a special expansion pack. For the uninitiated, Fluxx is a straightforward card game. 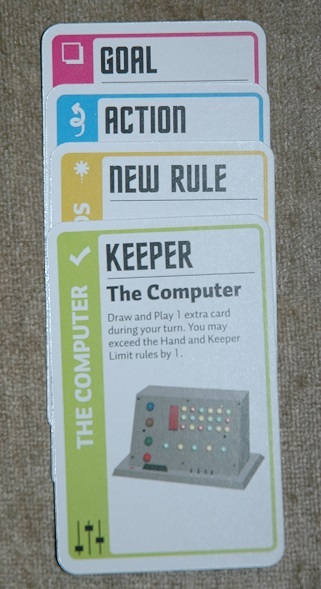 You collect keeper cards and put them into play. Different combinations of keeper cards complete different goals, and each player has the chance to put different keeper cards and goal cards into play in order to win. So you might find yourself working toward completing the goal at hand when suddenly somebody plays a new goal, and the object of the game changes. Along the way, players affect how the game is played by utilizing action cards and new rule cards which alter what players can and can’t do. Suddenly, you’ll have to trade your hand with another player, or start drawing three cards each turn instead of one. 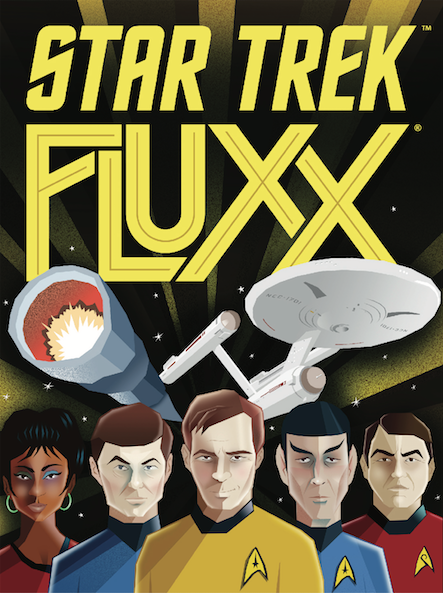 Star Trek Fluxx marries the chaotic gameplay of the now-classic card game with familiar characters and themes from the iconic science fiction franchise to create a fresh and enjoyable play experience. The special touches are immediately identifiable, as the title at the top of every single card is written with the famous Star Trek font. Even as you collect and play cards bearing the images of beloved characters like Kirk, Uhura, and Spock, you’ll find yourself on a strange new world, as unfamiliar new actions and obstacles appear in your path. 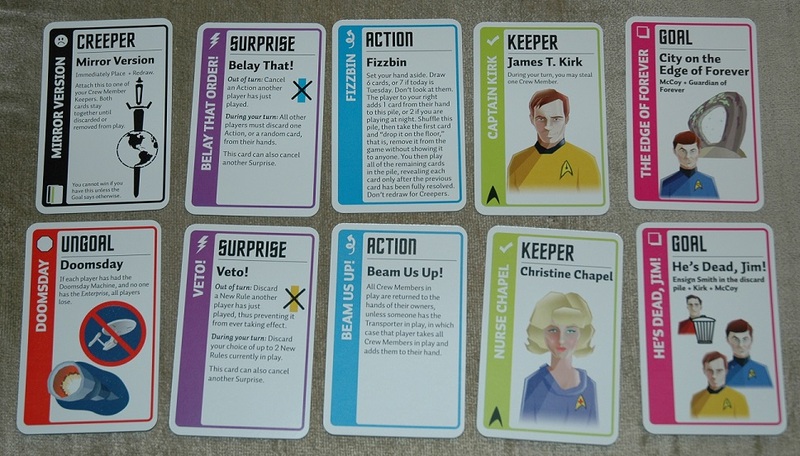 I encountered Action cards I don’t recall ever seeing in previous Fluxx games, like Taxation, which requires every other player to give you one card from their hands, and Brain Transference, where you switch seats, cards, Keepers, and Creepers with another player. Not only that, but lurking in the deck amidst rules, keepers, and goals is an Ungoal, a card that works like a goal, except when all of the conditions on the card are met, everyone loses. But that unpleasantness is balanced nicely by the many references to the classic show featured throughout the game. As a long-time Star Trek fan, it warmed my heart to see the goal card Majel’s Voice, which credits actress Majel Barrett (wife of Star Trek creator Gene Roddenberry) in her dual roles as Christine Chapel and the voice of the Starfleet computers in future editions of the series (as well as Deanna Troi’s mother, Lwaxana, in The Next Generation). These clever touches not only add depth to the gameplay, but serve as welcome nerdy reminders to fans of the series, little inside jokes that entertain, even as they wink and nod in tongue-and-cheek fashion. 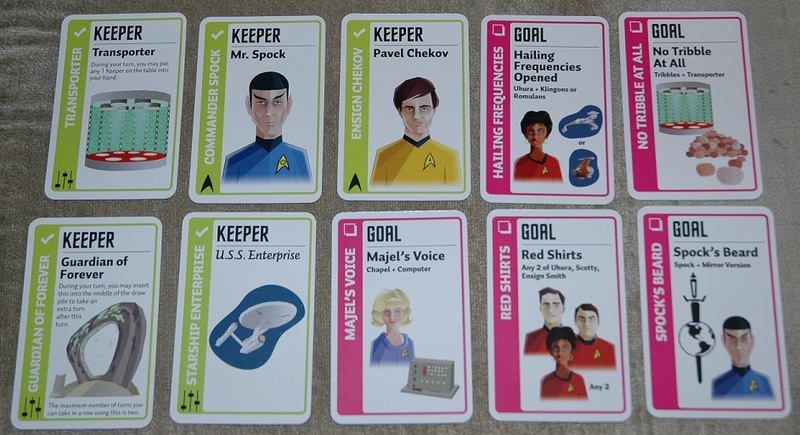 The Star Trek: The Next Generation edition of Fluxx covers a lot of the same ground as Star Trek Fluxx — including a special font for the card titles, Ungoals, and gameplay mechanics built around the technology like the Transporter — but adds numerous little touches that make for an enjoyably distinct play experience. The Holodeck, for instance, comes into play with several cards, proving to be just as big a distraction (and occasionally, annoyance) as it was in the TV show. Some of the Keeper cards also grant additional actions to the players who use them — like taking additional cards, resolving Creepers that would prevent you from winning the game, etc. — that make them more desirable and handy than Keepers in other editions of the game. Not only that, but the cards are packed to capacity with inside jokes and fun references to events from the series. From the officers’ poker night to Picard’s harrowing declaration that “There Are Four Lights,” many of the show’s most memorable moments are reflected in some way in the gameplay. 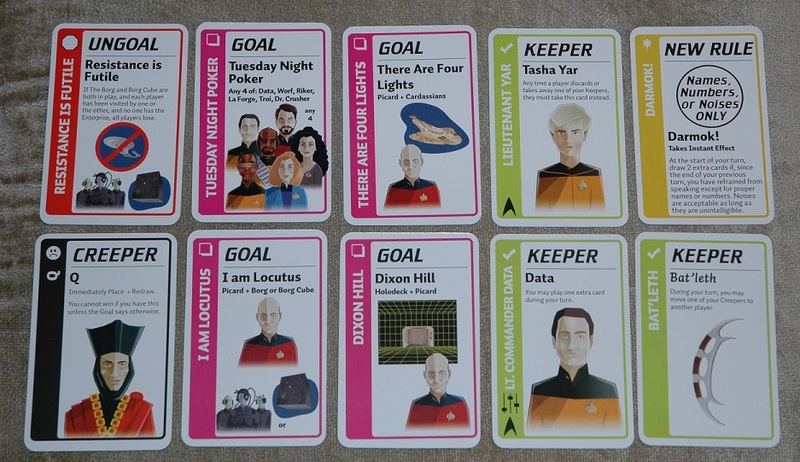 Heck, there’s even a rule card that rewards you for communicating using only names and numbers like the aliens in the classic episode “Darmok.” It’s a super-clever idea based on a much-loved episode of the show. 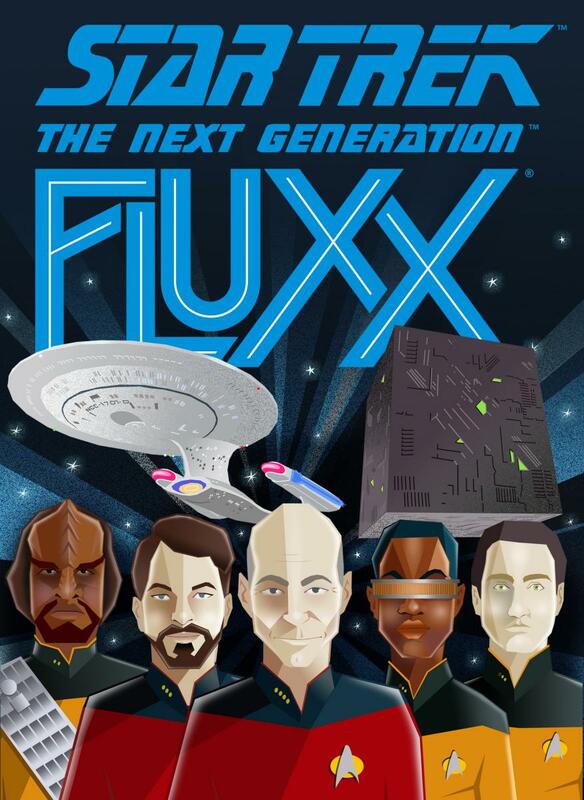 Star Trek: The Next Generation Fluxx has all of the strengths embodied by Star Trek Fluxx, but still feels like it was created specifically for fans of the Picard years. It’s an elegantly balanced approach. And, for the very first time, two Fluxx games have been designed so that you can combine and mix them to create a unique play experience! Although there’s nothing stopping you from mixing Fluxx games — the card backs always look the same, after all — sometimes differing games don’t mesh well, spoiling the fun. 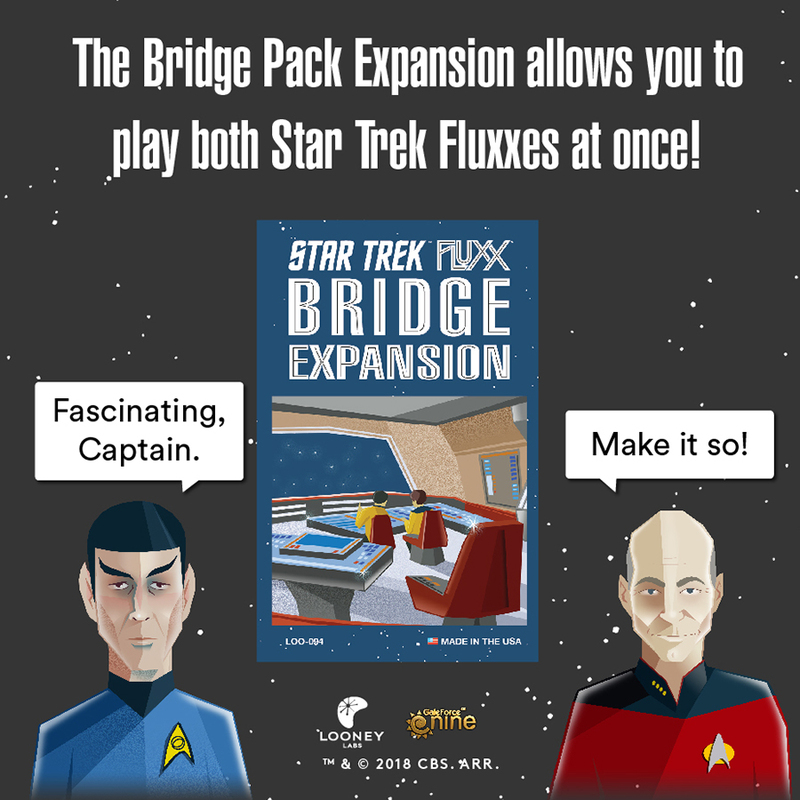 But in this case, not only were the two games designed to have similar elements — crew members, technology, ships named Enterprise — but there’s a small bonus pack, The Bridge Expansion, which is crafted to make the most of merging your two games. Yes, much like the Borg, you can assimilate each game’s individual strengths into a single, unified core. 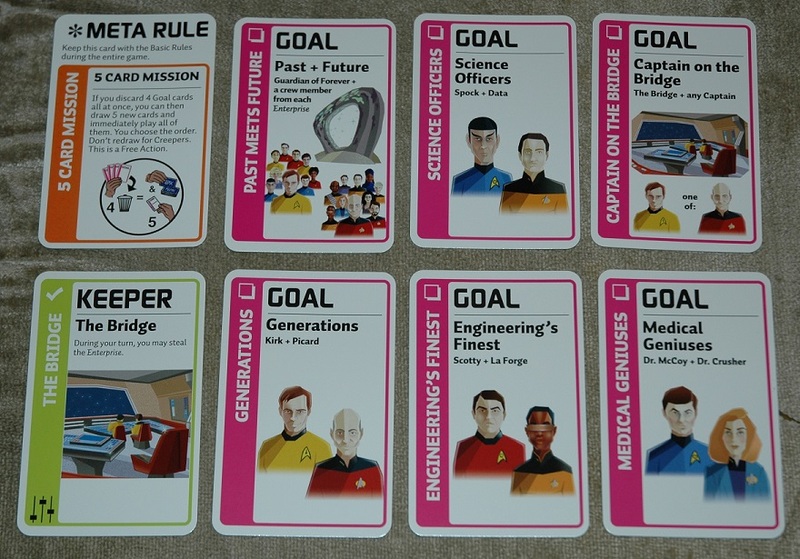 With goals that encourage crossovers between the two shows, as well as a rule card called The 5 Card Mission (referencing the U.S.S. Enterprise’s original 5-year mission), The Bridge Expansion allows for double the Fluxx-fueled chaos and fun. Whether you’re choosing to play one of these new star-spanning editions of the game, or combining all three products for the ultimate Star Trek Fluxx experience, you are guaranteed to be surprised and amused. Looney Labs games continue to innovate, entertain, and grow in both complexity and cleverness, and they’ve truly outdone themselves this time around.